Our approach to investment management is rooted in a simple philosophy – we align our management approach with your investment objective. Like our clients, we are more interested in consistency of returns, capital preservation, and investment growth than intermittently spectacular returns. To accomplish this end, we blend high quality, sustainable-growth equities with high quality intermediate-term bonds to create a custom investment portfolio designed to meet your specific investment objective. The tabs shown below further discuss our philosophy as it relates to blended portfolio management, equity selection, and fixed income investing. If Da Vinci’s “simplicity is the ultimate sophistication” comment is applied to investing, the result may well be a blended portfolio. A portfolio of high-quality growth stocks blended with high-quality bonds may accommodate both the multi-dimensional investment objectives most investors possess and also be the antidote to the increasingly complex investment world. By the time they have accumulated significant assets, most investors realize they have several investment objectives. While still seeking growth of their nest egg, they are now equally concerned with its preservation. They may also need their portfolio to provide a steady stream of income, either now or in the future. Our blended account approach is designed to meet those multiple investment goals. Also different from what most financial advisors currently prescribe, we believe that effective diversification can be achieved without the complexity and cost that comes with so many investment plans today. The financial industry continues to add more products and asset classes intended to offer new investment opportunities and less risk from the added diversification. But as we have learned in recent years, during times of financial stress, most of these asset classes tend to behave in similar fashion. Having more “eggs” in a portfolio basket accomplishes little if all the eggs crack during a fall. The majority of our clients choose our blended account strategy because it is simple, yet effective. It may run contrary to conventional wisdom, but a simple portfolio of high-quality stocks with a variety of market capitalizations that conduct business across the globe, coupled with the right types of bonds can achieve the results sought by many investors today. A portfolio comprised of superior businesses is the foundation to successful long-term investing. 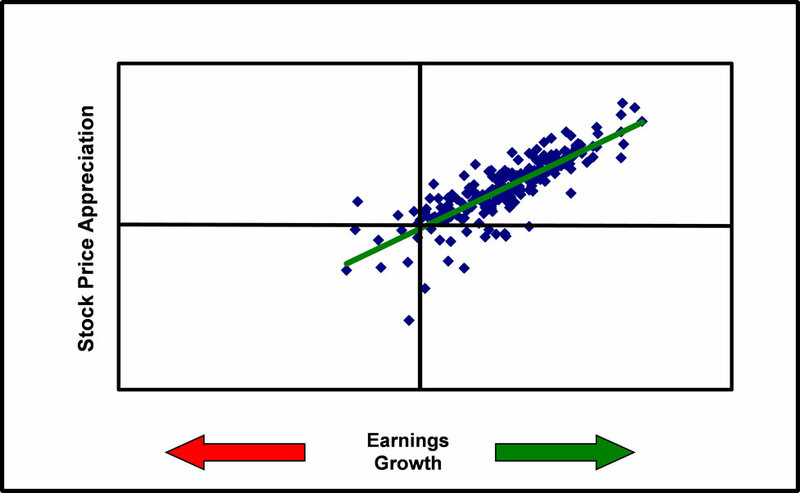 A company’s earnings growth – the quality, sustainability, and consistency – is the primary determinant of its long-term stock price appreciation. Once attractive businesses have been identified and studied, shares should be accumulated only when the price offers an attractive risk/reward tradeoff. Building a portfolio of fundamentally superior growth businesses and avoiding over-paying for their shares should reduce volatility and generate strong price appreciation. As the chart to the right illustrates (click it for a larger view), over time, the market rewards businesses that can grow earnings faster, more reliably, and more consistently with higher stock prices (upper–right quadrant) and punishes those that cannot with lower stock prices (lower-left quadrant). If you would like to learn more about our equity philosophy, please click here. While many investors view bonds as merely income producing securities, we take a different and much broader view of bond investing. We believe that bonds can not only produce rewarding returns, but they can also reduce risk and provide effective portfolio diversification—at the very times when diversification proves most elusive. 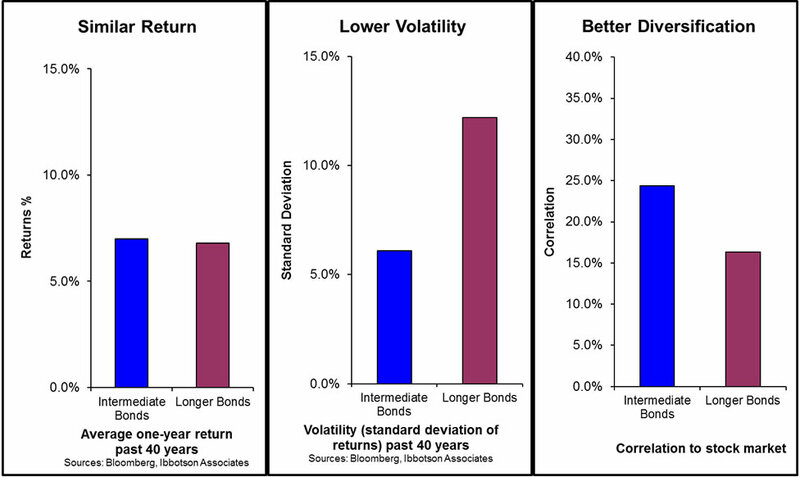 Bonds can, in essence, become a risk thermostat within an asset allocation plan. Just as a room thermometer can help keep its occupants comfortable during uncomfortable weather, bonds can help dial portfolio risk into a client’s comfort zone. Bonds can play an important role in smoothing the ride along the way that is part of every investment experience. But to do that effectively, only bonds with risk characteristics different from stocks can be used. 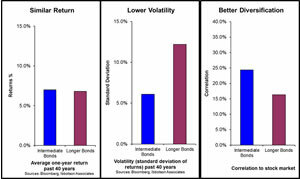 When interest rates are rising, long-term bonds can decline in value similar to stocks. 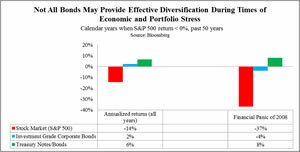 In our view this is an outcome inconsistent with the role bonds are intended to play within a portfolio. We, therefore, focus on bonds with short- to intermediate-term maturities to help minimize risk. The chart to the right (click it for a larger view) helps explain this using historical data. Likewise, in periods of elevated economic stress and uncertainty, low credit quality bonds can suffer equity-like declines. Again, this is unacceptable if bonds are to deliver effective diversification. It is in just such periods of duress for stocks and most other assets which also coincide with increased joblessness, soft real estate valuations and personal financial stresses, that diversification proves illusive. The chart below (click it for a larger view) provides some historical perspective. For this reason, we typically invest in high-quality taxable and tax-free bonds.